o,p′-Dichlorodiphenyldichloroethane (o,p′-DDD) and Perthane, when added in a concentration of 312 μM to homogenate and cytoplasmic fraction of dog adrenals, activate glutathione reductase. 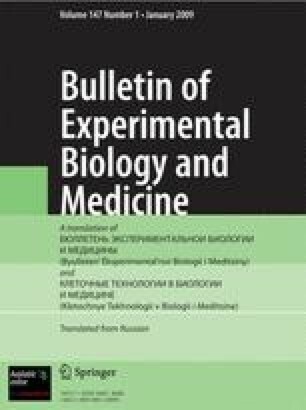 In a concentration of 156 μM, o,p′-DDD and Perthane do not affect glutathione reductase activity of the dog adrenals. When given in vitro, o,p′-DDD and Perthane activate glutathione reductase of the guinea pig adrenals. o,p′-DDD has no effect on glutathione reductase activity of the cytoplasmic fraction of dog liver and kidney, thus confirming the high specificity of its effect on the adrenal cortex. Laboratory of Pathophysiology, Institute of Endocrinology and Metabolism, Kiev. Translated from Byulleten' Éksperimental'noi Biologii i Meditsiny, Vol. 85, No. 2, pp. 159–161, February, 1978.